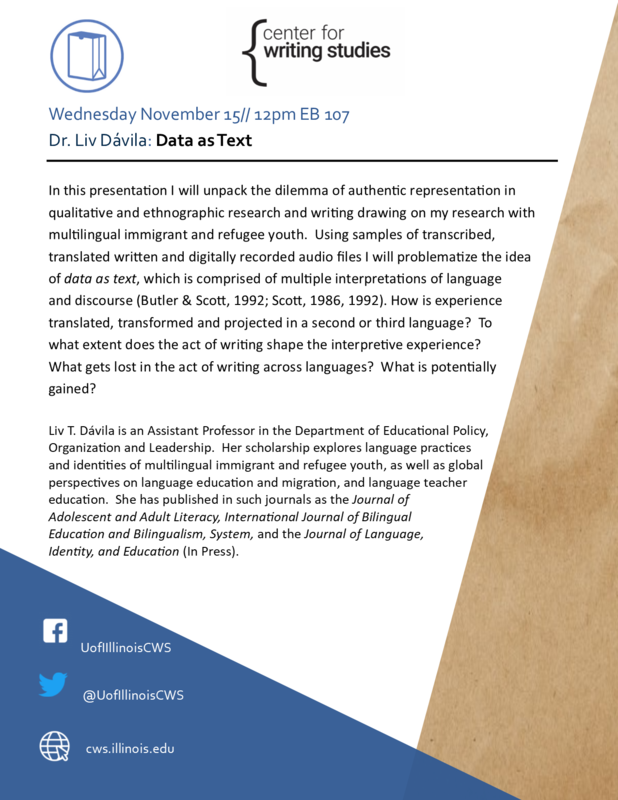 As part of our ongoing Research-in-Progress Brownbag Series, Dr. Liv Davila—Assistant Professor in the Department of Educational Policy, Organization and Leadership—offered a presentation, “Data as Text,” in which she discussed ways the act of transcription itself works as an interpretation of data. Davila works with multilingual immigrant and refugee youth who often codemesh among the various languages they have in their repertoire. Analyzing this translingual data, Davila grapples with the ongoing questions: “If experience is wedded to language, how is experience translated, transformed, and projected in a second or third language? Can one fully capture experiences in a second or third language?” and “Is the act of interpreting experience in another language an experience itself?” Sharing transcript excerpts from both her published work and work in progress, Davila “problematizes the idea of data as text,” by pointing to ways in which transcripts—rather than literally representing an interaction—are composed by multiple voices. For example, in an instance from her research in progress, Davila highlighted the ways in which the data was affected by various factors. Since this particular sample was collected while she was present, Davila herself appears as a speaker in the data sample. Without prompting, the outside transcriptionist labeled her as “T” and the various youth speakers as “S1,” “S2,” and so on, thus shaping the interaction as one between a teacher and students, though Davila was, in fact, an outside observer within a classroom setting. The transcriptionist, through a simple choice of letter, therefore recasts the interaction as a teacher-student interaction. Davila also discussed mediation within participant interactions themselves. She introduced the idea of fictionalization among her research participants, giving rise to the questions: “How do students channel power through the words they use to describe themselves and retell events? Does it matter that accounts are fictionalized by participants? Can truth be found in fictionalized accounts? Can fictionalized self-representations perhaps yield more power or influence than ones that are not fictionalized?” Since Davila’s research interests center on populations that are often marginalized by mainstream culture—immigrant and refugee youth—she considers that students play with fictional versions of themselves to push back against hegemonic controls they can’t otherwise combat in their day-to-day existence. Finally, Davila asserts that when conducting ethnographic research, researchers should consider the ownership of words: what various interview participants say belongs to them, but also what they say then in part belongs to the interviewer. In the cases Davila discussed, the experience was further mediated by the role of the transcriptionist. Davila’s presentation pushes anyone conducting ethnographic research to consider how we define authenticity in regard to our data. While we may actively consider how we analyze language in participant interactions, we might not be as attentive to how our transcripts also interpret data, and how our research methods necessarily affect the data that we collect.